Beast Brawlers is making an appearance at the Electronic Entertainment Expo (E3) from June 12, 2018 to June 14, 2018 in Los Angeles, California! How to find us: Come check us out at the SUBNATION booth by the entrance of the South Hall. Look for the white Volkswagen Jetta with drawings of Captain Marvel. 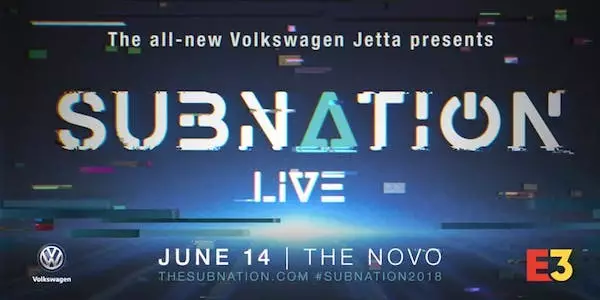 Thanks to our partners at Amazon GameOn, we're giving away two (2) tickets to the sold-out SUBNATION LIVE - the official afterparty of E3, featuring Deadmau5! How to win: From their own devices, E3 attendees can compete in a Beast Brawlers leaderboard tournament for the highest "fame" points. The winner will be announced at the SUBNATION booth on Thursday June 14, 2018 at 1:00 pm. Players must be present to claim their prize! Download the game: If you're not brawling yet, download Beast Brawlers on Google Play Store for Android or the Apple App Store for iOS now for your chance to win! Joining the tournament: Once players are in the game and played through the tutorial, the SUBNATION E3 tournament can be accessed by tapping Proxitus, the Guild Master, from the "inbox" on the right side of the main game screen. Come by the SUBNATION booth if you have any questions or need help with the tournament. Good luck! It has been a long journey, but today marks the official launch of Beast Brawlers for Apple App Store and Google Play in North America, Europe, MENA and Latin America Regions! Battles in the Arena will be as competitive as ever as we welcome new challengers from all corners of the World. But the work for us is just beginning: the Beast Brawlers team will continue to work hard to bring new content and features to the game, and provide players with a fun and competitive mobile gaming experience for years to come. Stay tuned for more exciting announcements throughout this launch week, and we will see you in the Arena!